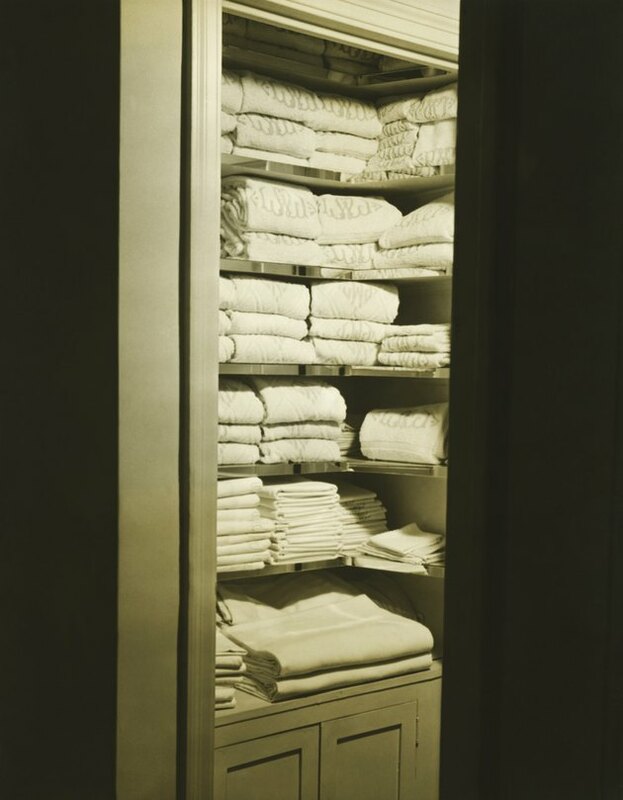 Without a linen closet, there is limited storage space for bathroom essentials, such as towels, washcloths, toiletry items and cleaning products. Some master bathrooms even include large walk-in closets instead of putting the closets in the bedroom. An open bathroom wall, a gap between a shower wall and structural wall, or an alcove are all suitable places to build a linen closet for the bathroom. The job requires framing in a wall, leaving a space for a closet door and installing shelves for storage. Adding a linen closet provides room for discreet storage of bathroom items such as towels. Designate a location for the linen closet, making sure the closet isn't too close to other doors or windowsills. Measure the width, height and depth of the area to use for calculating the amount of materials needed. Locate the studs on the existing walls with a stud finder and mark with a pencil. The studs provide anchors for the closet frame walls. Mark the area for the closet walls on the floor with a chalk line or pencil. This may require two chalk lines, depending on whether you're building in a corner with two existing surrounding walls or in an alcove with three surrounding walls. The lines you mark on the floor should line up with a stud in the wall. Transfer the marks on the floor to the ceiling, creating guides to keep the top and bottom of the walls straight. Cut 2-by-4s for top and bottom wall plates to which you will attach the wall studs. Leave a gap in the bottom plate to make room for the door, but use a single length of board for the top plate over the door. Screw or nail the top and bottom 2-by-4 plates into place on the floor and ceiling, with the wide side of the boards facing up and down respectively. Cut 2-by-4s for wall studs to be located every 16 inches; the number of studs needed depends on the size of the closet. A stud is needed on either side of the door opening, leaving a gap at least 1/2 inch taller and wider than the dimensions of the door casement. Nail the studs to the top and bottom plates with the narrow side of the boards facing the inside and outside of the closet; drive the nails in at an angle so they go through the stud and plate boards. Connect the door studs with a 2-by-4 header plate installed 1/2 inch above the height of the door and casement. Cover the wall frame with sheets of drywall. Apply construction adhesive to the studs, hold the drywall sheet in place, and then drive drywall screws into the studs spaced every 6 to 8 inches. If you need to use separate sheets of drywall, join two pieces with the joints split on the center of the stud. Hang the door in place on the studs and header plate. Add shims as needed to make it plumb and fasten it to the studs with screws or finishing nails. But open and close the door first to test its operation before fastening to the studs. Finish the drywall with joint compound. Tape the joints, apply joint compound with a drywall knife and sand high spots when the mud is dry. Add more joint compound as needed if low spots remain, then let it dry and sand to a smooth finish. Paint the drywall a desired color to match the bathroom design. Install the desired number of shelves on the closet wall, using your choice of shelving. Wire shelves are available in a variety of styles and are screwed into the wall. Alternatively, you can install side and rear wall ledgers, small strips of wood onto which you can set the shelf boards. Install baseboard trim around the outside of the closet to match the rest of the bathroom walls. Install the flooring inside and around the closet if the closet is not built on top of the existing bathroom floor.